Land grabbing by the Quartiero family to increase rice production theatens Quilombola communities. Also, agrochemicals endanger their health. The dispute for land between traditional communities and farmers has been part of the Marajó’s archipelago reality for a long time, at the mouth of the River Amazon. Since the 1990s, the descendants of Afro-Brazilian slaves – known as Quilombolas – have fought for the recognition of their territories, menaced by agribusiness interests who repeatedly invaded public lands. In 2011, the situation worsened with the arrival of rice plantations of the Quartiero family. The Quartieros are rice farmers, infamous for their reiterated use of violence against indigenous groups in the northern state of Roraima. They were expelled from indigenous lands in Roraima by the federal government, moving their activities to Marajó with the support of the State of Pará’s authorities. Both the farmers and the local government plan to turn the archipelago into a rice production district. The Quilombolas of Gurupá (Cachoeira do Arari municipality), who live next to Quartiero’s rice plantation, and the Quilombolas of Rosario (in the contiguous municipality of Salvaterra) have formed an alliance to oppose the expansion of rice plantations and pressure federal authorities for land recognition. Rice plantations in Marajó, which have been growing each year, have already caused several negative impacts to nearby communities. The constant spread of agrochemicals with airplanes puts the communities’ health in danger. Some people reported respiratory problems in the urban center of Cachoeira do Arari. 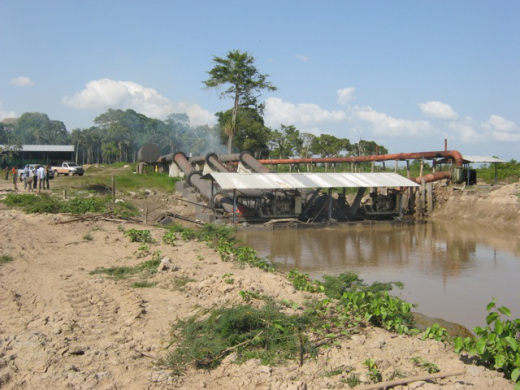 The same chemicals also affected the quality of the water used by the communities for different purposes and have put in danger their food security since the number of fish and shrimps have diminished. Mobility was also affected with some communities losing access to the urban center of Cachoeira do Arari. Furthermore, the farmers installed an unlicensed port in Quilombola land. 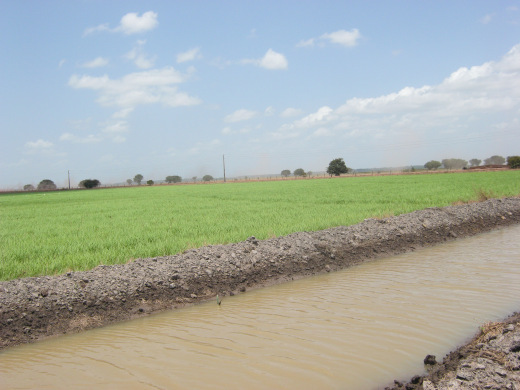 The state of Pará environmental authority (SEMA/PA) has issued a rural activity license enabling the establishment of rice plantations in 2010. However, Brazilian law requires both an environmental impact study and a report (EIA-Rima) for such activities, which haven’t been conducted. Moreover, Marajó is an environmentally protected area (APA), which means only low impact activities are permitted in the archipelago. This is not the case of large-scale rice plantations. The Quilombola communities of Gurupá and Rosario have denounced the impacts of rice plantations as well as the pressure they exert on their territory. The urban center of Cachoeira do Arari is literally jammed between the river and the rice fields. The Federal and the State’s public ministries (MPF/MPE) have acted as mediators between the communities and the farmers by trying to contain the growth of rice fields. They have issued an order prohibiting the expansion of cultivated areas until the environmental impact study and report (EIA-Rima) are done. They have also ordered the farmers to stop aerial fumigations of the rice fields. However, the farmers accepted neither of these orders. Both the MPF and MPE have also ordered Brazil’s Institute for Colonization and Agrarian Reform (INCRA) to speed up and conclude the land recognition process started by Quilombola communities in Marajó. In 2012 and 2013, the MPF and MPE conducted several public hearings on the situation of Quilombola communities affected by rice plantations. The Gurupá and Rosario communities have also received support from local Quilombola associations such as MALUNGU and ARQUIG. More rcently, the Brazilian Institute of Environment and Renewable Natural Resources (IBAMA) has fined the Quartiero family for destroying 132 hectares of native forest for rice production. Project Details - According to IBGE in 2014 the Marajó Island produced around 2235 tonnes of rice. Development of Alternatives -Artisanal fisheries and other ancient rural activities. Why? Explain briefly. Despite the fact that both the federal and the state’s public ministries issued court orders to limit the impacts of rice plantations on the communities, the area cultivated keeps growing. The State of Pará keeps actively supporting the creation of a rice district. At the same time, the Quilombos of Gurupá and Rosario are still waiting for land recognition by the federal government.